People around the world say that Pinot Noir is a fickle grape, pernickety, precocious and hard to grow but here in New Zealand in the southern parts of the North Island and throughout the South Island it behaves like the best student in the class. The vigorous Cabernet Sauvignon on the other hand, which is regarded by worldly experts as easy to grow anywhere, is much more fickle in producing good grapes in the New Zealand climate and is only on its best behaviour when the growing season is hot and dry. That's the reason Cabernet Sauvignon is on the decline in New Zealand vineyards and Pinot Noir is streaks ahead in the popularity stakes. So what's the best grape to grow when you have a vineyard just north of Auckland where it is too warm for great Pinot Noir and too temperamental for consistent Cabernet Sauvignon? You experiment and find something else that's what you do. For David Hoskins of Herons Flight Vineyard in Matakana the 'something else' has become two Italian grape varieties with the exotic sounding names that roll off your tongue, Sangiovese and Dolcetto. David first planted the Tuscan native Sangiovese in 1994 and now has 10 growing seasons and several vintages behind him. He is convinced he has made the right decision and after tasting the resulting wines, I agree*. 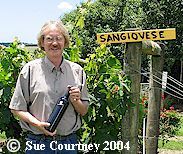 1998 was the first commercial release of Sangiovese for Herons Flight and of the two clones they had originally planted, the sangiovese grossso clone did particularly well, standing up to the often humid and wet summers of Matakana, summers that Cabernet Sauvignon would not tolerate. Now the French varieties on the vineyard are all gone and Sangiovese and more recently Dolcetto, have taken their place. The last of the Chardonnay went after vintage 2003. The current release is Heron's Flight Sangiovese 2002, an attractively coloured dense cerise red with a slightly spicy, peppery and creamy oak bouquet and chocolate creaminess in the palate. It’s a mouth-filling wine, chock full of ripe cherries and blueberries with subtle spices and a touch of acidity to lift the finish. It's robust and leathery when first opened but becomes creamy and smooth with lots of swirling. Wonderfully ripe with great structure, juicy tannins and a clean finish, it's everything you want in a big creamy mouthfilling red. Although it is deliciously enjoyable now (with decanting), the acidity will ensure that it ages well too. The 2002 was the ripest vintage they have had to date and the quality of the vintage shows in the resulting wine. It's beautifully packaged in a tall Italian bottle adorned with a pewter replica of a heron in flight and although expensive, at NZ$50 a bottle, it's worth it. As well as the wonderful flavours and headiness of the wine, you have a great conversation piece for the centre of the dinner table. It's a rich wine made to go with creamy cheese though I thought it just fine with a Tuscan style tomato soup and Neil had it with bacons and mushrooms, both dishes from the Herons Flight Café. It's also divine when served with a tenderloin of pork served with a tart cherry sauce. Dolcetto, a name that means 'the little sweet one', is a native of Piedmont in Northern Italy and makes a wine that is often described as have an 'easy charm'. The first ever harvest was this past weekend on Saturday 27th March 2004. The grapes looked stunning, though we were told to reject any bunches that looked unripe or where grapes had started to raisin. They grapes we picked tasted ripe and sweet and the juice after the crush had good colour and tasted crisp with ripe berry flavours. All the hallmarks for a good wine are there. Is David onto another winner? Patrons of the Heron's Flight Café will have the opportunity to find out sometime in 2005 when the resulting wine will be released. * The Heron's Flight Sangiovese 1999 was the first release as the 'flagship' wine and was reviewed as Wine of the Week in December 2000. Check out the Heron's Flight website for more information about the wine and where to buy - though you can always buy direct from the vineyard.